The goblet squat is a great beginner-level progression of an air squat because it can help beginners add resistance to the exercise while simultaneously perfecting their squat form. 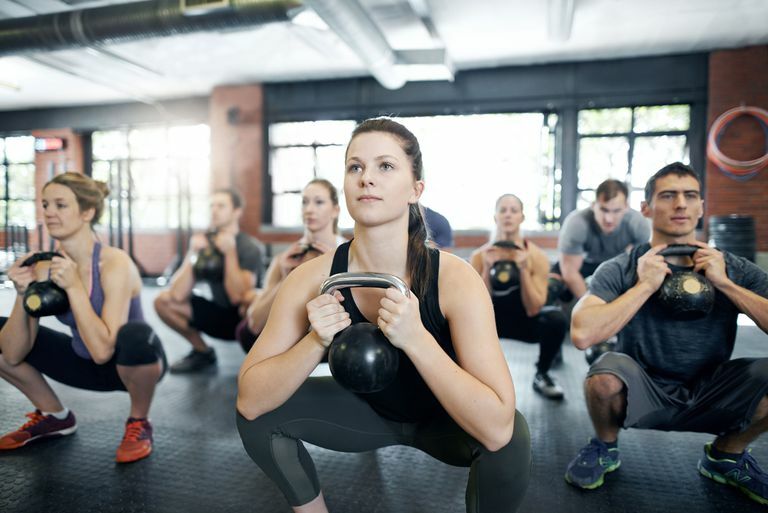 One of the best things about the goblet squat is that it's designed to help you move through a full range of motion while working to prevent common beginner-level mistakes, like leaning too far forward from the waist or allowing your knees to cave inward. But it's not just good for beginners—exercisers of all levels can use the movement as a solid warm-up during a lower body workout, or as a way to progress to a weighted front squat using a barbell. As with all squats, the goblet squat targets all the major muscle groups of the lower body in a compound fashion. This translates nicely to functional everyday movements, as it mimics squatting down to pick something up off the bottom shelf at the grocery store, or getting out of bed in the morning. The more you train with exercises and movements that mimic day-to-day life, the more strength and energy you'll have to get you through the day. The goblet squat works all the major muscle groups of the lower body, including the quadriceps, glutes, hamstrings, and calves. But it also engages the core and the spinal erectors of your back, your forearms, and even, to some degree, your shoulders and upper back, as you have to actively engage them to help keep your chest and torso tall throughout the movement. In essence, it's a total-body exercise. Since the kettlebell is held in front of your body, this exercise engages the quadriceps slightly more than squat variations where the resistance is carried behind the body, as with a back squat. If you're looking to build extra strength in your quadriceps while performing a total-body move, goblet squats are a good option to try. One of the greatest benefits of the goblet squat is how it helps you improve your squat form. While just about everyone is familiar with the general squat form, it's amazing how often people make mistakes that could contribute to injuries, particularly of the low back or knees. The goblet squat can help you identify and fix some of the common problems that occur during all types of squats. Since you're holding the weight in front of your body, you become more aware of the importance of keeping your torso tall and your core engaged as you move through the squat. For many people, as they begin to lower into the squat, they start tipping forward from the hips, leaning their chest toward the ground, compromising the neutral position of their back. When you hold the resistance in front of your body during a goblet squat, you realize you have to roll your shoulders back, keep your core engaged, and keep your torso upright as you squat down in order to prevent being pulled forward or off-balance by the kettlebell's weight. The goal is to get your elbows to touch the insides of your knees at the bottom of the goblet squat, so this squat variation encourages proper knee alignment with your toes. It's common for people's knees to angle in slightly as they squat down, something referred to as "knee valgus." This often becomes even more pronounced at the bottom of the squat, when you transition from the downward (eccentric) portion of the exercise to the upward (concentric) portion of the exercise. This improper knee alignment makes it more likely for you to experience knee pain or potential injury because more stress is placed on the inside of the knee as it moves through a full range of motion. By getting your elbows to touch the inside of your knees at the bottom of the squat, you're essentially requiring your knees to track in line with your toes. Even if your knees are still angled slightly inward at the bottom, your elbow placement gives you an opportunity to check your form and make sure your knees are tracking properly before you transition to the upward portion of the exercise and return to standing. This helps reduce the likelihood that your knees "collapse" inward during this transition, ultimately helping protect you from potential pain or injury. You don't need much to get started with the goblet squat—just a kettlebell or dumbbell and enough space to stand and move comfortably with your feet roughly hip- to shoulder-distance apart. Stand with your feet slightly wider than hip-distance apart, your toes angled slightly outward. Hold a kettlebell in both hands at your chest, gripping the handles as though you were cupping a goblet—one hand on either side of the handles. Bend your elbows so the goblet is positioned right at the center of your chest. Engage your core and look straight ahead—you want to keep your back neutrally aligned and your eyes facing straight ahead throughout the squat. Press your hips back and begin bending your knees to perform the squat. Inhale as you perform this downward phase. Focus on keeping your chest tall as you continue pressing your hips back and lowering down. Make sure your weight remains evenly distributed across your foot, or slightly more weighted toward your heel—you shouldn't come up on your toes as you squat. The goal is to get your hips below parallel with your knees. Check your position at the bottom of the squat—your elbows should be positioned on the inside of either knee at the lowest point of the squat. This helps ensure that your knees remain aligned with your toes as you move into the deep squat position. Press through your heels and reverse the motion to return to the starting position. Exhale as you rise, and be sure to press your hips forward at the top of the squat to more fully engage your glutes. Complete a full set and carefully rack the kettlebell. Always avoid dropping weights from a height. The kettlebell should always be "racked" close to your body at your chest when performing a goblet squat. Simply make sure your elbows are fully bent and the kettlebell is close to you so you don't feel like you're actively engaging your biceps to hold it in place. If you hold the kettlebell farther from your body, you have to engage your biceps, forearms, and even the anterior portion of your shoulders to a greater degree to prevent your chest and shoulders from tipping forward as you squat down, pulling you off balance. Not only does this make it harder to maintain proper form, but it will also limit how much weight you can use when performing the exercise. Your legs are able to carry and support a much greater level of resistance than your biceps and forearms are, so making sure your arms aren't doing most of the work to hold the kettlebell in place is important for ongoing progression. Leaning or tipping forward from the waist as you perform a squat is a common mistake. This compromises the neutral alignment of your spine and, in the case of the goblet squat, makes it more likely you'll lose your balance or rise up on your toes as you squat down. This is because the weight of the kettlebell is likely to pull you farther forward. To prevent this forward lean, set up in front of a mirror so you can see your side in its reflection. Before you begin your squat, draw your shoulder blades toward your spine and roll your shoulders back. Engage the muscles of your core, and as you start to press your hips back to start the squat, watch yourself in the mirror. If you notice your chest or shoulders collapsing or rounding forward, or you see yourself leaning forward at the waist, try looking up at a slight angle before re-engaging your shoulders to pull them back and draw your chest up again. You may not be able to lower yourself as deep into your squat, but that's okay. You can work on your range of motion over time. The important thing is to correct this forward lean so you can see greater improvements in form, range of motion, and resistance-level over time. Since the kettlebell is held in front of your body as you perform the goblet squat, if you have other form problems (for instance, you hold the weight too far from your body, or you lean forward as you squat down), you're also more likely to make the mistake of rising up on your toes as you squat down. This is more likely to throw you off balance, compromise the integrity of your knees, and prevent you from increasing the resistance of the exercise over time. Your weight should actually be evenly distributed evenly across your entire foot, with the exception of the toes—none of your weight should be supported on your toes. As you squat down, make sure your chest and torso remain upright and tall, and try wiggling your toes a little as you squat. This will help remind you to keep your center of gravity positioned farther back, more centered over your heels than farther forward on your foot. The beauty of the goblet squat is that it actually helps correct the common squat problem of knee valgus or the caving inward of the knees. As stated previously, by trying to get your elbows to touch the inside of your knees at the bottom of the squat, you're essentially training yourself to keep your knees properly aligned with your toes. At the very least, it gives you a physical reminder to double-check for this common problem at the deepest point of the squat, before you transition to standing up again. Since this is the point at which most people experience knee valgus, it's the perfect way to correct the problem. However, it is still a problem and one that should be checked. As you squat down, your knee caps should essentially align with your second toe throughout the exercise. If they seem to be angled slightly inward, engage your glutes and hips to pull your knees outward slightly. If adding weight to the goblet squat is proving too difficult, do the exercise as an air squat, but hold your hands together at your chest as if you were gripping a kettlebell. You can still move through the squat the same way, making sure your elbows touch the inside of your knees at the bottom of the squat. Then, as you grow stronger, simply add a light kettlebell to the movement to continue seeing gains. The goblet squat is essentially a precursor to a front squat with a barbell. This is because, just like the front squat, the goblet squat requires you to position the added resistance (the kettlebell) in front of your body at roughly shoulder-level, rather than behind you, as is the case during the traditional back squat, where the barbell is positioned across the back of your shoulders. If you're ready for a challenge, hold a barbell in both hands at your shoulders (this requires some flexibility at your shoulders to do it correctly), so your elbows are pointing straight ahead and your palms are facing up. From this position, do the squat just as you did with the goblet squat. The weight and size of the barbell make this more difficult, as well as the somewhat-awkward positioning of your arms. You'll also notice immediately that you have to keep your torso upright and your chest tall, or you risk being pulled forward and off-balance by the weight as it's positioned in front of your body. Generally speaking, the goblet squat is a safe and effective beginner-level squat variation that actually helps you identify and correct common squatting mistakes. That said, individuals who experience knee or back pain with squatting are likely to experience it with the goblet squat as well. Try limiting your range of motion at first to see if you can perform the exercise without pain, and as you get stronger, gradually deepen your range of motion. If you ever experience sharp or shooting pain, discontinue the movement.